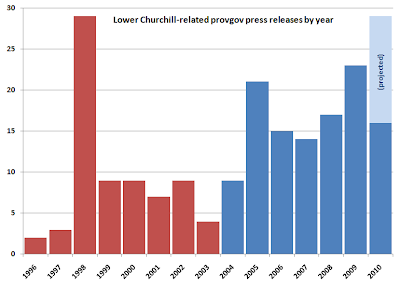 Total number of ProvGov press releases issued in July: 161 (-62 from June). Total number with the phrase "Williams Government": 18 (+8 from June). Sycophancy index: 11.2% (+6.7% from June). The numerator goes up, the denominator goes down, and so for the fourth time in eight months, the monthly sycophancy index nudges north of 10%. Happy times! Danny Williams-Government Himself kicked things off on the very first business day of the month, when he, not his long-suffering Minister of Fisheries, whoever that is, got to bask in the reflected glory of fisheries scienticians. Felix Collins added another name to the scoreboard later that day, complete with potentially unfortunate visual. Terry French and Jackman each tipped one in the next day, Jackmans’s making him the first to break from the pack of singletons. The next day Susan Sullivan, with another triple-dollop of WilliamsGovernment, announced that DWG “invests” in youth, perhaps in the same way some people “invest” in derivatives or Beanie Babies, while SuperJerome, tying Jackman for the lead, made sure the day after that didn’t go WilliamsGovernment-free. It was a breathtaking start, with at least one does of WilliamsGovernmenty goodness for every working day of the month to date. The whirlwind of Williamsosity could not go unrecognized, as this corner obligingly did on the eighth, and the anti-Newfoundland Premier-Negative Quebec Daily Newspaper on the twelfth. It is, of course, entirely coincidental that the match promptly went into a lull that was not broken until the 16th, when Tom H., on behalf of something called “Newfoundland Labrador Housing”, put one between the posts. SuperJerome consolidated his lead on the 20th, with some happy health-care related news for St. Anthony. Heck, he may have even started returning the Northern Pen’s calls in his exuberant state. French, Jackman, Hedderson, and SuperJerome again turned the third week of the month into another in-your-face every-day barrage of WilliamsGovernmentium. The final week of the month started off quiet, but Jerome on the 28th, and Felix Collins on the 29th saw to it that Our Dear Ego got stroked to a happy month-ending. Final tally: Sullivan, Tom M., and DWG Himself, one each; French and Collins, two; Tom H. and Jackman, three, and Kennedy, five. Snatching the title back from Hedderson, and owning or co-owning the podium for the third time in five months, your July sycophant of the month is Jerome! Kennedy! Congratulations! The City of Mount Pearl has reached an agreement with unionized city employees. The deal with CUPE Local 2099 includes a 17 per cent wage increase over the next four years. Collective bargaining sessions began in May, and talks broke off last month when an agreement on wages couldn't be reached. The city and the union met with a conciliator earlier this month, and they reached a tentative agreement earlier this week, before the strike deadline. Shhhh... don't tell you-know-who. He might slam you. Last fall, in partnership with Nalcor Energy, the Geological Survey division published a series of high-resolution aeromagnetic maps of the west coast of Newfoundland and Labrador at an approximate cost of $1 million. As if real estate prices weren’t already going through the roof in Labrador City and Wabush; now buyers will be paying a premium for the ocean views? The provincial government in the province of which Labrador is part, almost seems surprised at the pickup in demand on the Labrador Straits ferry service, it would seem from a CBC report on Tuesday. This follows the bizarre situation earlier in the summer, when the coastal Labrador ferry and marine services were delayed, ostensibly due to "ice conditions", after one of the mildest ice years in living memory. At least one cruise ship made it to ports ordinarily served by the Bond and the Ranger before the Bond or Ranger did. Apparently, the Usual Gang of hand-wringers who fret and fuss about every wrinkle and bug in Marine Atlantic's service, and stop at nothing, not even calling for separation from Canada, in their fustigation against the "constitutional cattle-boats", are unable for comment. Anyone knowing the whereabouts of the Usual Gang are urged to call the hand-wringing hotline at 1-888-590-VOCM. That's 1-888-590-8626. For the record, from the pages of The Telegram past, in its coverage of budgets (and one fiscal update), is Bradley George of the Canadian Federation of Independent Business, taking the Williams Government to task for the massive surge in the provincial government payroll during the Williams era. The Canadian Federation of Independent Business (CFIB) said the organization would have preferred a little consultation on the fee increases. "The minister said the government has prided itself on no tax increases, but CFIB sees fee increases as tax increases," said Brad George, director of provincial affairs for CFIB. "Our members aren't against user fees increases as such. What our members are looking for is that a user fee is representative of the service that the fee charges for. I'd want to see a process put in place to examine these fee increases." Business organizations are happy with the provincial government's fiscally prudent ways - but they're still looking for tax relief. The Canadian Federation of Independent Business (CFIB) says nothing was announced in Monday's budget to alleviate tax burdens for small business owners. CFIB asked the government to start reducing the 15 per cent tax businesses pay on their insurance premiums. That issue has become all the more pressing in the face of skyrocketing insurance premiums. "It was a mixed budget for us," said Bradley George, CFIB director in Newfoundland. "We were pleased to see they addressed the debt ahead of schedule. They kept spending in check - something that our members were looking for. "The No. 1 concern of our members in the last few years is insurance. They didn't touch the insurance premiums tax this year or last year." The Canadian Federation of Independent Business (CFIB) called decreased tax rates and the indexing of personal income tax rates a huge benefit for the province. "It is a good tax budget - it makes us a leader in Atlantic Canada, " said Brad George, CFIB's director of provincial affairs for Newfoundland and Labrador. "Taxes were a top priority for our members this year. Overall, we gave this election budget a B-plus." Also topping the CFIB tax list, though, was eliminating the 15 per cent provincial tax on insurance premiums and gasoline. Neither was touched in Thursday's budget. "We'll be pursuing those next year," said George. Local business leaders say the fiscal update by the provincial government Tuesday shows the Williams administration is sticking to sound economic principles as it moves towards less profitable years. Bradley George of the Canadian Federation of Independent Business (CFIB) said the federation liked initiatives announced in the fiscal update. "We were pretty pleased," George said. "There had been some concern about where the government will go with this and we are pleased to hear the government will hold the line with tax reduction." He said CFIB members feel tax reductions will help stimulate the provincial economy during the global downturn. Also, George said, the financial statement and the large surplus will likely boost consumer and business confidence in the province, a key to keeping the economy going strong even when oil prices are low and resources aren't paying royalties to the province. The provincial budget got a lukewarm reaction from business representatives Thursday, many of whom were happy with the potential spinoffs of the $900-million infrastructure investment, but disappointed with smaller- than-desired tax cuts. Bradley George, the provincial representative for the Canadian Federation of Independent Business, said the budget did little to spur small businesses, despite some programs aimed directly at them. "It's not a bad budget, but it's not really a small business budget either," he said. He said his members were looking for more tax relief. The extra tax credits in the budget only move the small business corporate tax threshold up to $500, 000 from $400,000, a small percentage from his perspective. Most business and labour leaders don't mind stimulating the province's economy at the expense of a balanced budget - for now, anyway. Bradley George, director of provincial affairs for the Canadian Independent Federation of Business, gave this year's budget a C-plus. Bigger tax reductions - such as eliminating the payroll tax - for business owners might have improved that mark, he said. "More tax reductions would have allowed more small business owners to create jobs." He says CFIB members always support a balanced budget, but they don't mind a short-term deficit. "When it comes to the small business corporate tax rate, we had asked for a complete elimination of that five per cent. P.E.I. has done that, and we believe Newfoundland and Labrador should do the same." He said it would make the province more competitive with the rest of Atlantic Canada. The Canadian Federation of Independent Business is slamming the new contract for town employees in Grand Falls-Windsor. It includes a 14.5 per cent wage increase over four years, something the CFIB suggests is too much. Spokesman Bradley George says rewarding unionized workers with a rich contract is not at all sensible. He hopes small business owners do not bear the brunt of it. He says they already shoulder a greater portion of the municipal tax burden and receive fewer municipal services for their tax dollars. Grand Falls-Windsor Mayor Al Hawkins doesn't understand why council is being criticized for giving its unionized employees a 14.5 per cent wage increase over the next four years. Hawkins says he feels the deal is fair and wonders why George hasn't criticized the 16 per cent raise given workers in St. John's or the 18 per cent being sought by Mount Pearl employees. Over the past four years, the provincial public-sector workforce has increased by 16%. The provincial public-sector payroll has increased by 30%. 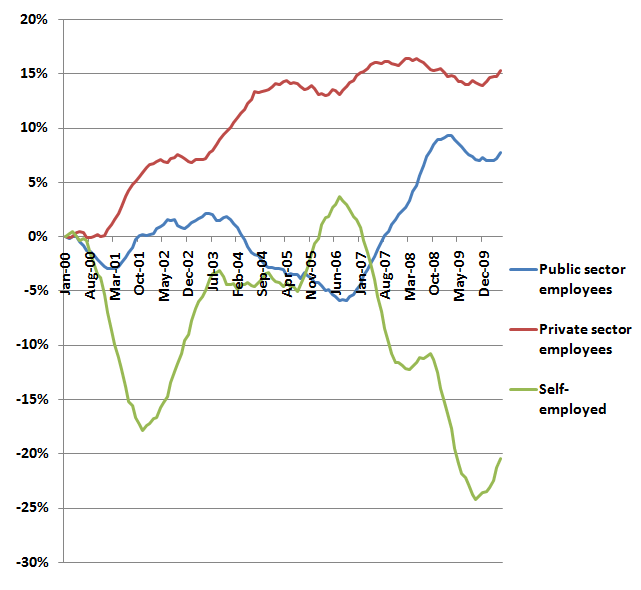 Direct public-service employment has increased by over 20%. Provincial goverment salaries, per the estimates for FY 2010-11, are 53% higher than the revised estimated figures for FY 2006-07. Bradley George, CFIB: is it comfortable under that rock? Going out on a limb here, but could that be because…, with the exception of a water boundary with Nova Scotia, there aren’t any other neighbouring provinces? Wacky, but true! ... but Quebec and Newfoundland and Labrador are always at odds over something. It does get tiring. As usual, instead of sitting down and working out a solution that suits both sides, the two provinces are at odds right from the start and there is little doubt it will be up to a court to settle the standoff…. We always seem to come out on the short end when judges get involved. Well, as long as you forget about what the judges did in the Labrador boundary decision. Or what the awful judges did in the Canada-France maritime boundary delimitation. Or what those nefarious judges did in the Laurentian boundary case with Nova Scotia. But hey, as long as you ignore each case which isn’t consistent with the political mythology, and omit anything which doesn’t conform to your predetermined conclusion, then, sure, editorialist, we always seem to come out on the short end when judges get involved, except in all those other pesky cases when we don’t. The report of the November 2, 2006 provincial by-election in Signal Hill–Quidi Vidi is dated April 16, 2007. The reports of the February 8, 2007 provincial by-elections in Ferryland, Kilbride, and Port au Port, the February 12, 2007 by-election in Humber Valley, and the March 13, 2007 by-election in Labrador West, are all dated July 2, 2007. The report on the October 9, 2007 provincial general election is dated July 7, 2008. None of these reports were tabled in the House of Assembly until April 27, 2009. There are three classes of employment represented: public-sector employment, private-sector employment, and self-employment. And once again, the percentage changes are derived from rolling twelve-month averages in order to smooth out seasonal fluctuations. Note that the "public sector" in this data is broader than the provincial public sector that is the subject of previous pretty charts. This "public sector" includes local and federal government employment. 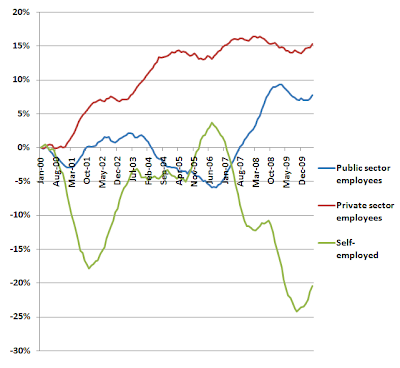 By looking at the relative change, it becomes immediately clear that public-sector employment is rising as a proprtion of total employment not only because the public sector workforce is increasing in size, but also because private-sector employment has at best hit a plateau, while self-employment tanked during the recession. Note that private-sector employment, apparently agnostic about the "Williams Effect", grew faster between 2000 and 2003 than at pretty well any time since. The current labour situation at the Port of Montreal has the potential to have significant negative impacts on the Province of Newfoundland and Labrador, the Honourable Tom Hedderson, Minister of Transportation and Works, said today. The minister advised residents and businesses, particularly on the Avalon Peninsula, that they should be aware of these possible impacts. In response, on Tuesday, the Port of Montreal advised residents and businesses that the lockout is not the problem. Yeah. Ice conditions. That’s it. 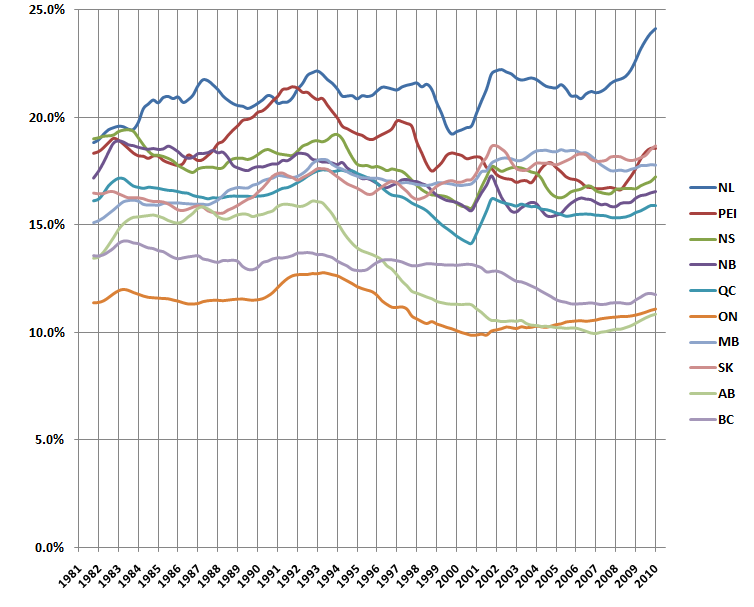 The following chart shows the relative growth of the provincial public sector, in all ten provinces, as compared to the arbitrarily-chosen benchmark of January 2000. In the past decade, the absolute numbers of people in NL who work in the provincial public sector — the provincial civil service, public health care, social service, and education system, and public post-secondary education institutions — has increased by 35%. 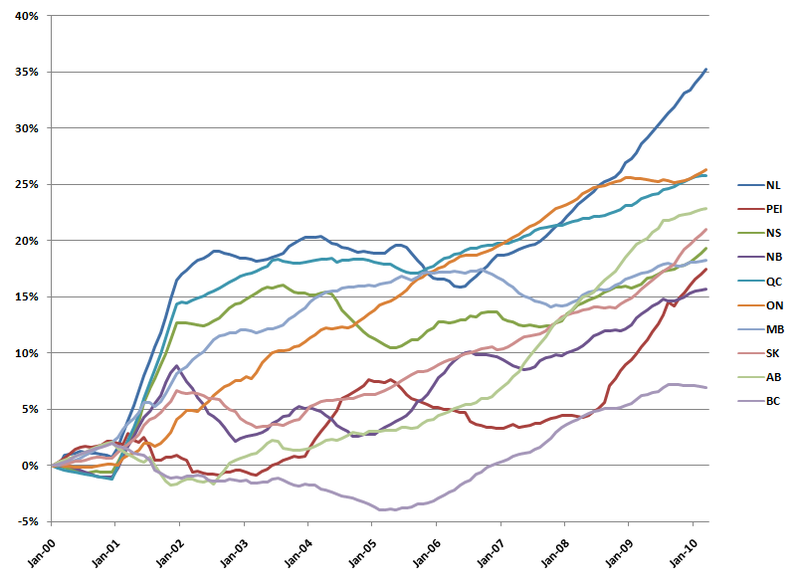 Not only is that the largest increase, start to finish, of any of the ten provinces, for most of the decade, NL has topped the chart in terms of the growth rate. And, starting in 2006, that growth curve spiked steeply upwards, with annualized growth of up to seven percent per year, unmatched by any other province except, starting in the second half of 2008, Prince Edward Island. 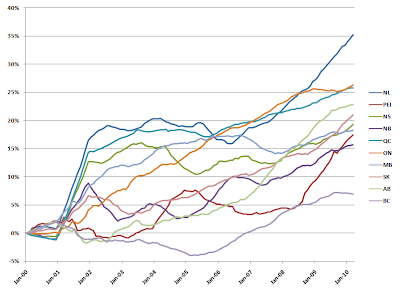 The chart is derived from statistics in StatsCan Tables 183-0002 (government employment). 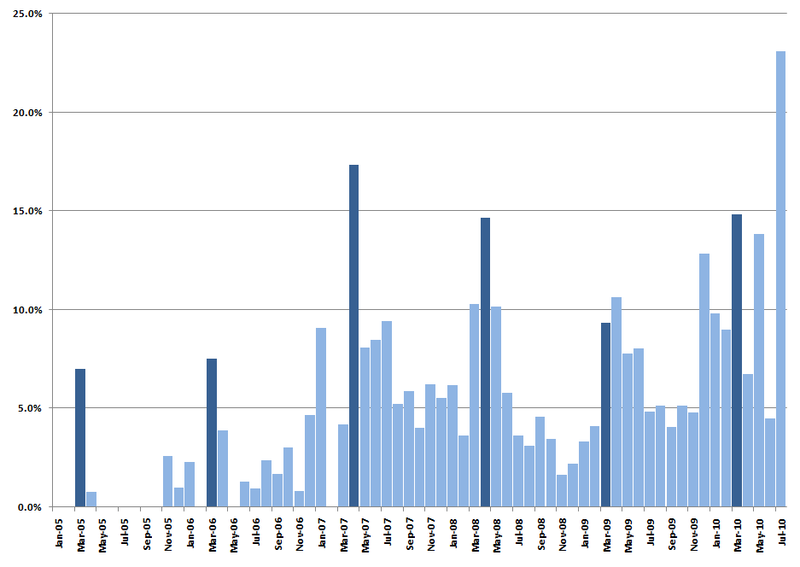 The figure for any particular month is the rolling average of provincial public-sector employment during the preceding twelve months inclusive, divided by the comparable figure for January 2000, and reduced to a percentage change. Here is the same data as in Friday evening's posting, only pushed back to 1980 — the dawn of the StatsCan series — to provide the bigger, longer-term, picture. Again, you are looking at a rough measure of the total provincial public-sector employment (provincial government, public schools, health care, and post-secondary eduction; local and federal government employment not included), as a share of total employment in each province. We have always maintained that we would adhere to the principle of adjacency where there was a business case to be done. Am I going to say we are not going to use the resource for anything else? Absolutely not. But if there is a business out there, a corporation out there or a person out there with an idea that can use that mill, needs to use the fibre, needs to use the hydro asset, needs to use the human resource and skill development we have out here, we are willing to tie that together as a package if it benefits the province of Newfoundland and Labrador and the people of the region." Scant weeks ago, Principled Skinner was telling everyone the exact opposite. In entirely-related news, the A-Word — which is supposedly one of the government's cherished principles, according to Principled Skinner — is nowhere to be found in his cabinet colleague Kathy Blunderdale's stunning masterwork, The Lower Churchill Construction Projects Benefits Strategy. The steady progress towards the start of the project is evident in the substantial progress on preliminary engineering, aboriginal agreements, environmental assessment and, in the last week, the request for proposals for engineering consultants as well as the benefits strategy. I would have expected both the opposition and The Telegram to applaud the release of information on this important project for the people of the province. Not for the first time does Danny Williams-Government expect such a rapturous welcome. When He announced the Hebron deal three years ago, Fearless Leader Himself excused Himself from any need to bring it before the Legislature, saying that the opposition parties, "would probably carry the government in on their shoulders and pass it with a blink." Our government remains committed to openness and transparency and will continue to inform residents in a timely and responsible manner. Again thinking back to the Hebron announcement, not only did Our government, committed as it is to openness, transparancy, and informing residents in a timely and responsible manner, fail to bring the deal before the legislature, Dear Leader, Mr. Accountability Himself, "jokingly" warned a reporter not to stand too close what he termed "a secret document". ... and who says Dannystan has a poor record on recycling, anyway? What could be more recycle-y than to generate your press releases using the mail merge function in Word? 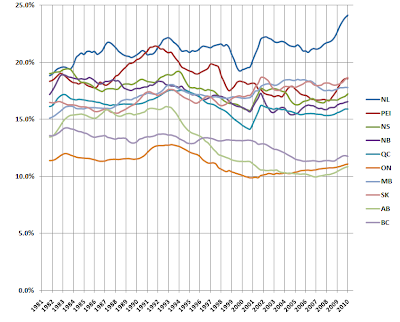 Herewith, a synchronic and diachronic comparison of the relative size of the provincial public sector in each province, as a share of total employment, over the past decade. The figure is arrived at by dividing the total number of people employed in the provincial civil service, public health care, public education, and public post-secondary education, and dividing into the total employed labour force. In order to smooth out some seasonal variation, the figures here are the trailing rolling averages of the figure for the previous four quarters. For example, the figure on the right edge of the graph is the average of the four quarters which terminate in, and include, the first quarter of 2010. Note that the latest four-quarter average for Newfoundland and Labrador is 24.1%; slightly lower than the most recent raw quarterly figure of 26.2%, bandied about in the previous postings in this series. 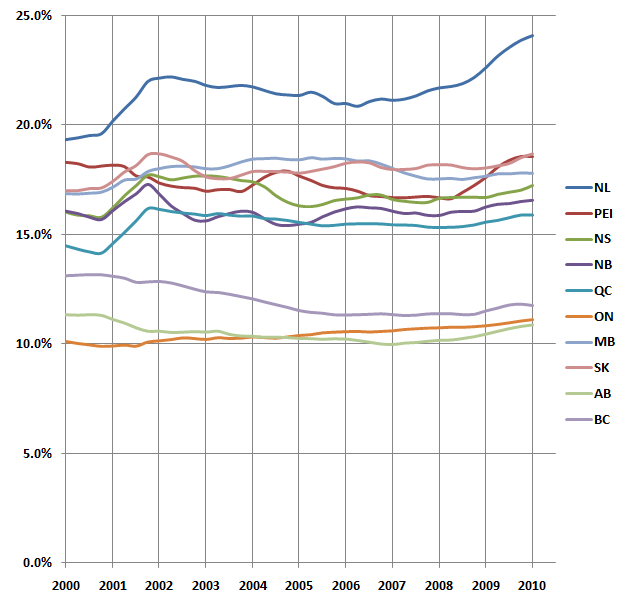 At the bottom are the three “private sector” provinces, BC, Ontario, and Alberta, whose provincial public sectors make up relatively lower proportions of their overall employment force than the other seven. In the middle is the “main sequence” of six provinces whose provincial public sectors employ between 15% and 20% of the total employed population. And then there’s the province which, for the entire period under consideration, has had the largest share of its working population working, directly or indirectly, for the provincial taxpayer. 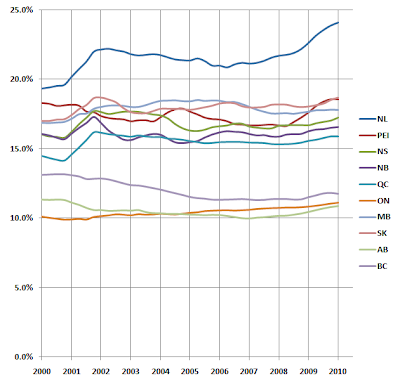 While, for much of the first half of the decade, the gap between Newfoundland and Labrador and the middling provinces was slowly narrowing, in 2006 it started to open up again, and dramatically. As noted previously, there has never been a provincial labour force, for as long as statistics have been kept, so reliant on provincial public sector employment. Meetings between the Ministerial Task Force dealing with the closure of the mill in Grand Falls-Windsor and those affected by it are being called successful. The Chair of the Task Force, Innovation Trade and Rural Development Minister Shawn Skinner, says they met with town officials, the community development committee, Exploits Valley Joint Councils and union representatives. Skinner says the Task Force also discussed the mill's future. He says the resources are there and ready for the taking, as long as it's an employer that will benefit the people of Central Newfoundland. In other words: Ministerial Task Force Successful, Ministerial Task Force Says. The Honourable Clyde Jackman, Minister of Fisheries and Aquaculture, today provided an update on the Memorandum of Understanding (MOU) process. The MOU was signed on July 11, 2009, by the Fish, Food and Allied Workers, Association of Seafood Producers and Provincial Government. The Federal Government has been participating in the process in an ex-officio capacity. Members of the Ministerial Task Force established to respond to the closure of the AbitibiBowater mill in Central Newfoundland and Labrador will be in Grand Falls-Windsor today (Thursday, July 15) for general discussions with various community groups and town councils. That is to say, 10.5% of the entire provincial population, 21.7% of the entire labour force, and 26.2% of the entire employed labour force, was employed in some form or another in the provincial public sector. The comparable figures for the ten provinces as a whole were 6.8%, 12.6%, and 13.8%, respectively. In fact, in no other province has the provincial public sector ever been as large, for as long as Statistics Canada has been keeping count. * Figures may not add exactly, due to rounding. Figures calculated from StatsCan Tables 051-0005 (population), 183-0002 (government employment) and 282-0001 (labour force and employment). Once upon a time there was a Premier who ratcheted up the nationalist rhetoric and fixated on being the guy who, once and for all, would develop the so-called Lower Churchill. He was gonna do it. He negotiated with the Innu, he was looking at undersea transmission, he played hardball with Quebec. Why, once he even went upalong and delivered a series of barnburner speeches with the not-so-subtle threat that he might even be the one to “pull the plug” on the so-called Upper Churchill and force Quebec to do something or another. Then, and now, there were, and are, those who say that it was all just bluster and blarney and a cynical long-term PR exercise designed to play to the home audience. In fact, at the height of this episode of lowerchurchillmania, in 1998, the government of Brian Tobin issued a total of 29 press releases about what it had taken to calling the “Labrador Hydro Project”, so that there was something “new” about this exciting development about once every seven government business days. So perhaps it is wise to put today’s latest Announcement That Will Blow Your Minds into the appropriate Bore You To Tears context. Kathy Dunderdale – His Good Name is nowhere near the announcement, for a wonder – claims that the government has, through hard-fought negotiation with itself, guaranteed 28 million person-hours of employment on the construction, engineering, and management of the so-called Lower Churchill project. Or, it would be, except for the inconvenient math: 28 million person-hours, times zero chance of the project going ahead, equals zero million person hours. Never fear, though; there will always be steady work writing, releasing, and spinning the latest press release extolling the latest important development in the Lower Churchill project that We are always twirling, twirling, twirling towards, but never actually building. Apart from that annus mirabilis of 1998, the Tobin and Grimes years saw the provincial government comms shop pimping the Lower Churchill story about six times per year. Danny Williams-Government has roughly tripled that pace, with no signs of slowing down. Today’s release makes sixteen for 2010 to date. We aren’t half way through July yet, and there are two more CRA polling months still to come. Without even factoring in the parallel campaign of puffery HappyNews coming out of NALCO(R)’s own comms shop, Danny Williams-Government is well on track to out-BrianTobin the 1998 version of Brian Tobin before the year is through. That is to say, 26.2% of the entire employed labour force of the province, was employed in some form or another in the provincial public sector. The comparable figure for the ten provinces as a whole was 13.8%. In the thirty years in which Statistics Canada has measured public sector employment, the percentage of employed people in Newfoundland and Labrador labour force who are employed in the provincial public sector has never been this high. That is to say, 21.7% of the entire labour force of the province – including the unemployed – was employed in some form or another in the provincial public sector. The comparable figure for the ten provinces as a whole was 12.6%. In the thirty years in which Statistics Canada has measured public sector employment, the percentage of people in the Newfoundland and Labrador labour force who are employed in the provincial public sector has never been this high. The (Other) Quebec Daily Newspaper, the one that has supposedly never been very supportive [of] Our Dear Government or Dear Leader, is remarkably unquestioning and uncritical in its assessment of the latest displacement of the imaginary Lower Churchill project McGuffin. That is to say, 10.5% of the entire provincial population – including children, retirees, and those unable to work – was employed in some form or another in the provincial public sector. The comparable figure for the ten provinces as a whole was 6.8%. In the thirty years in which Statistics Canada has measured public sector employment, the percentage of people in Newfoundland and Labrador who are employed in the provincial public sector has never been this high. My goodness, it's been a long time since the last provincial cabinet resignation/shuffle/shufflette. How will We get through the summer without the traditional short-notice swearing-in ceremony down at the future Presidential Palace? The cult goes into overdrive. Why? So far for the month of July — and, admittedly, there's more July to come than has already transpired — the golden boys and girls who communicate, 24/7, on behalf of the Regime, have worked that magical phrase, "Williams Government", into nearly one quarter of the very important news releases that have been issued on the ITAR-DAN wire. That, at least provisionally, would give July 2010 the highest sycophancy index of any month since ever. Dark columns indicate budget months, traditionally the WilliamsGovernmentiest months of the year. The Williamsification of Government only began in earnest in 2005, so a few outlying early examples from 2003 and 2004 are disregarded here. You'd think there was some kind of campaign on, or something. The Williams Government has invested $134,000 in a new prisoner transport vehicle that is designed specifically for the transfer of inmates. The Honourable Felix Collins, Minister of Justice and Attorney General, unveiled the new equipment today. Good ol' Williams Government. Have we mentioned Williams Government. Williams Government did this. Williams Government. Williams Government. Williams Government, Williams Government, Williams Government. Strangely, even while branding this announcement with His Good Name — Williams Government! — it would appear that someone forgot to include Our Dear Pitcher Plant Logo in Our Dear PTV's livery. On the heels of the announcement of significant investment by the Provincial Government for fisheries science research, the Honourable Clyde Jackman, Minister of Fisheries and Aquaculture, today outlined multiple investments and initiatives which demonstrate the high level of commitment of the Williams Government to the province’s fishing industry, including the fact that the budget for the Department of Fisheries and Aquaculture has increased by approximately 360 per cent since 2003. A summit with fishing industry stakeholders was held by the Honourable Danny Williams, Premier of Newfoundland and Labrador in 2006. In 2007, Premier Williams appeared on Larry King Live to address false information on the province’s sealing industry. In 2010, the Autonomous Tariff Reduction Quota (ATRQ) was reduced to no tariffs on the first 20,000 metric tonnes of shrimp entering the European Union (EU). This followed an extensive lobby of the European Union on the part of the Williams Government which included several trips to the EU and Ottawa by Premier Williams. The continued growth and development in this sector has been largely in response to the high level of investment on the part of the Williams Government. "High Level of Commitment to Province’s Fishing Industry Ongoing"? I would add that no one in the province in more committed than Premier (Danny) Williams to ensuring that Memorial has the best possible candidate at the helm to ensure that we have an internationally competitive and recognized university. Dr. Gary Kachanoski became president and vice-chancellor of Memorial University of Newfoundland on July 1, 2010. He replaced Dr. Christopher Loomis who served as president pro tempore from September 1, 2009 until June 30, 2009. Not only should His Premierosity be wary of taking the advice of His own hapless cabinet ministers, in claiming a superlative for the late session of the legislature, He ought to have remembered the inherent hazard in trusting to the Joan Burke Book of Records as a reference source for anything. "It's unfortunate that the company is not exactly stating the facts correctly... Obviously the way that this company conducted itself over the last three or four days shows that they're all over the place." Of course, "invite them to participate", translated from the Dannese, means, "hope, like the members of a South Seas Cargo Cult, that they'll air-drop us the money to pay for it". It's strange that Captain Autonomy of the MV Go-It-Alone would be hoping for federal participation in what is, at bottom, more a fed-bashing exercise than a scientific endeavour. It's stranger still that Captain Autonomy was somehow expecting federal involvement in terrestrial wildlife management. Caribou? Really? Is there no external party onto whom responsibility for caribou — or, at least some caribou — can't be shifted? What's next? Calling on Ban Ki Moon to intervene? What caribou research would Captain Autonomy like Ottawa to be more involved in? And why? For that matter, why is Captain Autonomy letting Laval University — which province is Laval in, Danny? — lead the scientific survey of the province's largest caribou herd? Fisheries science fared badly in the years following the moratorium, serving as a scapegoat to a smattering of politicians, fishermen and industry people who needed someone to blame. As pointed out by John Crosbie to angry fishermen, he didn't catch the fish — but neither did scientists. Scientists also never pushed for increased quotas, as did industry and many politicians, and their pleas for moderation in catches and warnings that model predictions were based on uncertain assumptions often went unheeded. - George A. Rose, yes, that George A. Rose, Cod: The Ecological History of the North Atlantic Fisheries, [Breakwater, 2007], p. 537. Meanwhile, the official opposition takes another pointless bite of the many-layered onion of irony. So, so far this summer, that's one release on the Marine Atlantic ferry, one on the Bell Island ferry, but, how you say — unacceptable silence? — on the longest ferry route that DW-G is responsible for. [The] Transportation Minister... said Friday they are working to repair the ferry as quickly as possible. During sea trials after the annual re–fit, [the Minister] said the crew discovered the ship's control system had to be replaced entirely. That part is on order but, in the meantime, he said there isn't another ferry available to replace the [vessel]. [The Minister] said technicians are trying to come up with a temporary solution, but that he isn't offering any guarantees. "Hopefully, I'll get good news, if not today, sometime in the next couple of days, whether or not we can do it. And if we can't do it, I'll have to go back to the people and say, 'it can't be done, and here, the complete system needs to be done, and this is the time it's going to take,'" said [the Minister]. Almost immediately, the cry went up from all the usual suspects on-air and on-line, about how the distant and uncaring government was running the ferry service into the ground, and how there should be a constitutional challenge because the ferry was supposed to be free anyway, and to heck with it, maybe we should separate. Oh, wait. Of course, none of those things happened, because the ferry service involved is the provincial one serving Labrador, and the minister involved is one Tom Hedderson. "The Government of Newfoundland and Labrador is making the right investments and coming up with the creative concepts to promote this province as a travel destination," Minister Hedderson said. "However, those efforts are constantly threatened by decisions made by transportation carriers such as Air Canada and Marine Atlantic. These decisions create obstacles which affect easy, affordable access to much of this province and that is a constant challenge to our ability to grow the tourism industry." Total number of ProvGov press releases issued in June: 223 (+21 from May). Total number with the phrase "Williams Government": 10 (-18 from May). Sycophancy index: 4.5% (-9.4% from May). It would have been hard to top last month's epic blowout... so they didn't even try. Despite the total number of ITAR-DAN releases climbing to a staggering 223 — certainly the highest on record since January 2005; possibly the highest monthly total ever — the WilliamsGovernmenty ones dropped back to below April levels, resulting in the largest month-over-month drop in the sycophancy index, ever. Oh? CRA was in the field in May? Really. Wow. Did not know that. Anyway... reliable Tom Marshall kicked things off for the month on June 2nd, reminding everyone of the Williamsy Awesomeness of Budgetosity 2010, answered almost immediately by his talented colleague Ms. Johnson. Recent high-roller Tom Hedderson got himself on the board, the traditional place of the Minister of Pavement, on the 11th, followed by none other than DWG himself, who, for good measure, WilliamsGovernmented himself three times in one release. Then, eleven more days of nothing. Not even the buzzing of a vuvuzela. The socceresque tedium was finally broken with a natural hat-trick by Tom Hedderson, with three consecutive days of Roadwork Rolling into Central Region, Roadwork Heads West, and the concluding episode of the trilogy, Road Improvements Coming to the Burin Peninsula. Jerome Kennedy capped the third week of the month with a single. Susan Sullivan got on the board on Canada Eve, and unlike last year, was careful to credit this July 1st hike in the minimum wage to You-Know-Who Government. And Tom Marshall made good and sure that anyone earning that higher minimum wage, or any other wage, would know who to thank for the take-home pay, with his second of the month, and the second triple-WilliamsGovernmenting to boot. But it was academic at this point. With his hat-trick plus one, Tom Hedderson handily defeats the other five scorers to reclaim the monthly title after Jerome Kennedy rudely interrupted his streak in May.